People often ask us to explain what a fireplace damper is. Well, a damper is the device that sits just above the fire. When you forget to ‘open the damper’ the room fills with smoke. And sometimes, when it rains and the ‘damper is open’, water will drop into the fireplace. There are several styles of damper that sit just above the fire-area and we can help you repair them when broken. Or, when they can’t be fixed, we can install a new one for you. There is another type of damper that many fireplace owners praise. 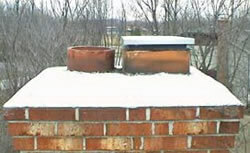 This type sits on top of the chimney and does what the interior damper does. 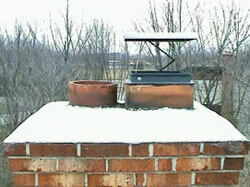 However, because it is outside, it can also prevent harmful rainwater from entering the chimney. 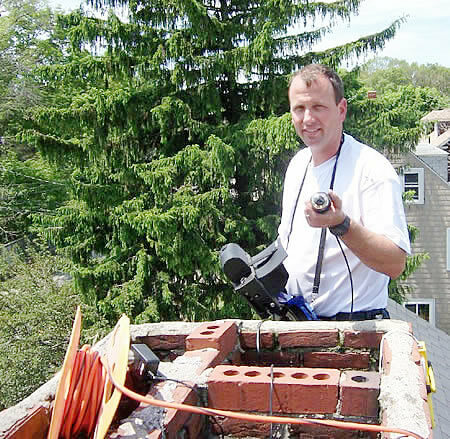 A chimney professional from Four Seasons Chimney Service will be glad to take a look at your current situation and recommend a solution that is best for you. Top sealing dampers are an effective way to keep more heat inside your home this winter. The damper (sometimes mistakenly called “the flue”) is a door or window inside your fireplace. When you open the damper to have a fire, the smoke goes through this door and out the chimney and not into your home. When the fireplace fire has gone out, the damper is shut so that your heat is not drawn up the chimney. Unfortunately, traditional dampersare Cast Iron and very leaky beause they do not always form a tight seal. Thus, although a traditional damper may be closed, much of your heat – for which you pay dearly – escapes up the chimney. We have been installing top sealing dampers for over two decades and have observed an influx of inferior quality products on the market. As Chimney Professionals, we install what we believe to be the best top sealing dampers available. To prevent heat loss, homeowners frequently install new windows or doors and even add additional insulation while overlooking a major source of heat loss: the heat that escapes right up the chimney through the supposedly closed fireplace damper! Have us come out to your home before you turn up the thermostat to see if a top sealing damper is right for your fireplace. Remember, replacing a faulty damper is much less expensive than replacing doors and windows – and faster, too! Note: Dampers can only be installed on fireplace chimneys not oil gas or woodstove chimneys.